Solar panels are an unlimited source of free energy that produce no pollution. During daylight hours every panel provides the maximum power level, 60kW. Generated power will increase/decrease linearly during dusk and dawn, and no power is produced at night. This means one solar panel produces an average of 42 kW over one day and night cycle. As already stated, solar panels produce energy only during the day, but you are likely to want your factory running at night as well. Accumulators can be charged up with solar panels during the day to power the base at night. Accumulators are not the only way to work with solar energy. Sometimes it is more economical to just avoid consuming energy at night. For example, if you power a bunch of electric mining drills and electric furnaces to produce iron and copper plates, you could build more drills and furnaces than you actually need, and store the excess metal production during the day. At night you can shut down the drills and furnaces, and let your factory run with the stored plates. Instead of storing energy, you would be storing what the energy is used for. The easiest way to achieve this is by connecting all your extractors and furnaces to an electric network with exactly enough solar panels to make them work during the day, and keeping this network away from your factory's main electric network. A single solar panel outputs an average of 42 kW over a day and requires 0.84 accumulators to sustain a constant power output through the night. It takes 23.8 solar panels to operate 1 MW of factory and charge 20 accumulators to sustain that 1 MW through the night. Changed tech requirement from Adv. Electronics to Electronics. Energy of the solar panel is now fractioned between all the networks it's connected to. 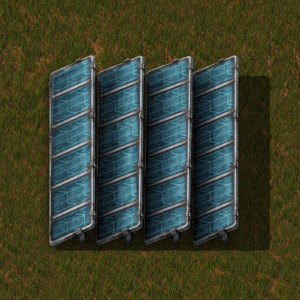 Massive optimisations to solar panel logic. Significantly slowed crafting speed to 10 secs from 0.5 sec. Made solar panels pre-science pack 3. Unplugged icon shown when not connected to any power transfer device. Priority of power consumption changed to consume from solar panel first.